Click on the playlist to watch more animal videos. Can you spot what the different animals eat? To meet another creepy crawly, click on the playlist. To find out more about animals' patterns, click on "Camouflage: Animal Hide & Seek" in the playlist. Scroll down and click on a play button next to a picture of the animal to hear its sound. Can you guess which animals are hiding? Introduce little children to the fascinating world of animals in this beautifully illustrated information book. 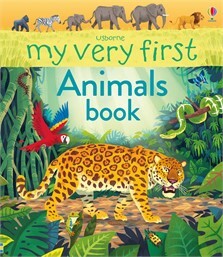 Each double page focuses on a different theme, from habitats and bugs to nocturnal animals and record breakers. With lots to spot and talk about on every page, simple text and links to carefully selected websites to find out more.